Sara Scott: The sergeant said we could be hear until morning. Do you know that if we sit here till then, it'll be the longest we've been together in the last three weeks? Mark Trevor: We may even get killed together. Every once in a while, a movie comes along that doesn't have a single bad scene in it, but yet it isn't a good film. Another Time, Another Place fits that mold, because its story keeps shifting gears and the characters never really come across as complete human beings. 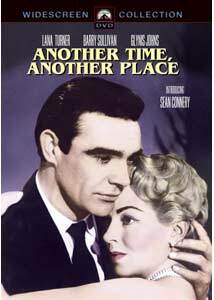 It begins as a romance between American journalist Sara Scott (Lana Turner) and BBC war correspondent, Mark Trevor (Sean Connery). The two stars make a beautiful pair as they secretly romance one another during the closing days of World War II. In fact, the opening scene where the two embrace each other while reporting on an unexploded bomb that may go off at any moment is a genuinely tense moment. The problem is that Stanley Mann's screenplay, based on Lenore Coffee's novel, climaxes in the opening scene. What could be a marvelous chronicle of a torrid love story set against the backdrop of war takes a drastic turn as Mark confesses to Sara that he is married with a child and will be returning home to them in Cornwall's St. Giles. The stage is set to have a cross-Atlantic neo-Casablanca, but then Mark dies unexpectedly while traveling to Rome to cover the German surrender (a true shame, because the charismatic Connery may have been a strong enough leading man to overcome the script's shortcomings). The emotionally distraught Sara is about to return to New York with her boss, Carter Reynolds (Barry Sullivan), but makes a pit stop in St. Giles. Wanting only to see the house where her now dead lover lived, she encounters his son, Brian (Martin Stephens), and wife, Kay (Glynis Johns). Overwhelmed by the encounter, Sara becomes perversely attracted to them and soon takes up residence in Kay's house, all while keeping her true identity a secret. The question is, how long will it be until the underlying tension surfaces and Sara's secret is revealed? The plot sounds much more interesting than its execution makes it out to be. Director Lewis Allen and his crew string wonderful images together. Jack Hildyard's black-and-white cinematography is graceful and the musical score by Douglas Gamley aids the visuals immensely. However, not a single frame sizzles with passion. As Sara eats dinner with Kay and quizzes her on the details of Mark's life, the drama never feels sincere. Everybody certainly seems to be putting their best foot forward, but unfortunately it's to no avail. Lana Turner gives a commendable performance, but I find it hard to sympathize with a woman who is knowingly tormenting a widow for her own personal gain. More disappointing is the waste of Glynis Johns' touching turn. She makes Kay into a very sweet woman, longing for companionship. However, the movie is practically half over by the time she enters the scene in any meaningful way. What this all boils down to is that there's never a connection with the characters. The treatment of the material by the cast and crew is technically proficient, but there's no gusto in their work. Everybody, including Connery in one of his earliest screen roles, moves like they're simply collecting a paycheck. It's just a shame their job didn't come with any fringe benefits. Image Transfer Review: The black-and-white cinematography comes across quite nicely in this anamorphic transfer. Contrast is good and depth is strong, helping to create a film-like look. Detail is also worthy of note. A few print defects crop up from time to time, but it's nothing distracting. Audio Transfer Review: The original mono audio track is preserved for this DVD release and is a crisp, clean listen. Dialogue is always audible and the musical score comes across nicely. Very well done. Extras Review: This is a barebones DVD release, featuring no supplemental material other than remote access English subtitles. A bit of a misfire, Another Time, Another Place never quite fires up the emotions for its audience. The acting is good and it is well made, but the script fails to make any human connection. The barebones DVD features good image and audio transfers, but it's not enough to merit a purchase.